3-17 Basic Slot Antenna and Its Complementary Dipole The slot antenna consists of a radiator formed by cutting a narrow slot in a large metal surface. Such an antenna is shown in figure 3-18. The slot length is a half wavelength at the desired frequency and the width is a small fraction of a wavelength. The antenna is frequently compared to a conventional half- wave dipole consisting of two flat metal strips. The physical dimensions of the metal strips are such that they would just fit into the slot cut out of the large metal sheet. This type of antenna is called the COMPLEMENTARY DIPOLE. 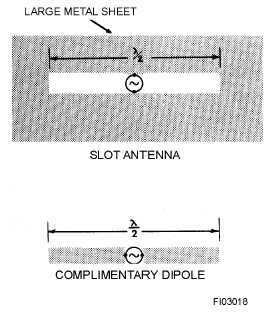 Figure 3-18.Slot antenna and complementary dipole. The slot antenna is compared to its complementary dipole to illustrate that the radiation patterns produced by a slot antenna cut into an infinitely large metal sheet and that of the complementary dipole antenna are the same. Several important differences exist between the slot antenna and its complementary antenna. First, the electric and magnetic fields are interchanged. In the case of the dipole antenna shown in figure 3-18, the electric lines are horizontal while the magnetic lines form loops in the vertical plane. With the slot antenna, the magnetic lines are horizontal and the electric lines are vertical. The electric lines are built up across the narrow dimensions of the slot. As a result, the polarization of the radiation produced by a horizontal slot is vertical. If a vertical slot is used, the polarization is horizontal. A second difference between the slot antenna and its complementary dipole is that the direction of the lines of electric and magnetic force abruptly reverse from one side of the metal sheet to the other. In the case of the dipole, the electric lines have the same general direction while the magnetic lines form continuous closed loops. When energy is applied to the slot antenna, currents flow in the metal sheet. These currents are not confined to the edges of the slot but rather spread out over the sheet. Radiation then takes place from both sides of the sheet. In the case of the complementary dipole, however, the currents are more confined; so a much greater magnitude of current is required to produce a given power output using the dipole antenna.